This is a photograph of Edward R. Sloan, born in 1883 in Seward County Nebraska. His family came to Kansas in 1886 locating in Sheridan County. Sloan graduated from Campbell College School of Law at Holton in 1904 and Washburn College law school in 1905. He was elected county attorney of Sheridan County in the fall of 1904 and was re-elected twice while maintaining a private practice in Hoxie, Kansas. In July 1911, Sloan established with Guy L. Hursh the Holton law firm of Hursh & Sloan. In April 1912, Sloan was appointed Holton's city attorney, a position he held for 19 years. In 1930, Sloan helped establish the Topeka firm of Sloan, Hamilton and Sloan, which included his younger brother Floyd and W. Glenn Hamilton. It was the predecessor of the firm Sloan, Listrom, Eisenbarth, Sloan & Glassman. He served three terms in the Kansas House of Representatives from 1923 to 1929. 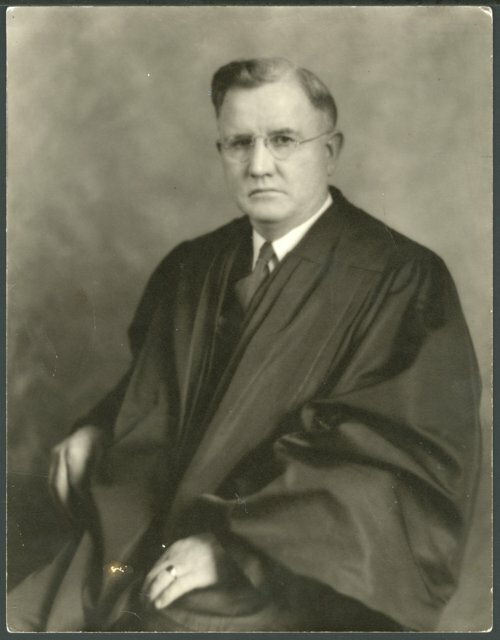 In March 1931, he was appointed by Governor Woodring to fill a vacancy on the Kansas Supreme Court. Judge Sloan served the remaining 21 months of the term but opted not to seek election for another term. Later, he was appointed to the Kansas Corporation Commission and served as chairman from 1936 to 1938. In 1947, he was appointed Referee in Bankruptcy for the District of Kansas, where he served for 14 years. He was a lecturer at Washburn University Law School and compiled a textbook on bankruptcy.